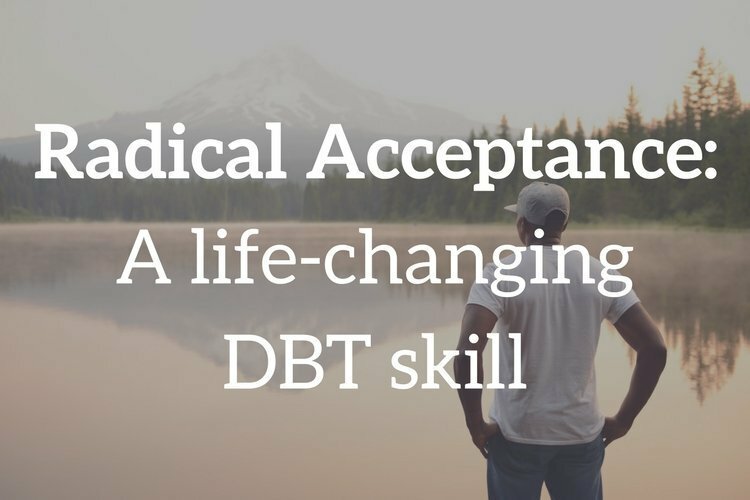 In our San Francisco Dialectical Behavior Therapy (DBT) skills group, one of the most life-changing skills we teach is called Radical Acceptance. Radical Acceptance is accepting what is – exactly as it is. It is saying yes to reality. It is saying yes to both reality as it is right now and to the reality of the past. No matter how painful or unfair it is. No matter how hurt, angry or ashamed you feel. Wait, what? I’m supposed to radically accept the unacceptable? Yes. You do not have to like reality, but you do have to accept it because what other choice do you have? Fighting reality does not change reality; it just increases your emotional suffering. Part of being human is experiencing pain. There’s no way around this. And it’s true that some people’s lives have more pain in them than others. But while pain is unavoidable, suffering is optional. Resistance is putting demands on reality to be different than it is. It is throwing a tantrum, in big and small ways. It’s not effective; it just keeps you in a war with you. Or with the world. And you will not win. The path out of suffering is to lay down your arms. Imagine how your life would be if you said yes to whatever is happening instead of no, no, no. What would you do? Would you cry, scream, grieve? Strong emotion often comes with radical acceptance. But if you allow yourself to feel that strong emotion, it will eventually move through you. And when it does, calmness follows and very often, a deep peace. In that place of deep peace, all sorts of transformative things can happen. You may see possibilities of moving forward that you couldn’t see before. You may forgive yourself. How would your life be different if you stopped fighting reality? What do you need to Radically Accept? Whatever is happening in the present, no matter how uncomfortable it is. It’s accepting big things like your life not turning out the way you hoped, a chronic illness, or a president in office who scares the living daylights out of you. It’s also accepting the smaller day to day things like public transportation shutting down, an event you were looking forward to getting cancelled, or being assigned a work project you don’t like. Everything that has already happened. Big and small things. The personal and the political. Childhood trauma, accidents, war. All of it. When working on radically accepting everything that has happened to you and those you love in the past, remember that radical acceptance does not equal approval and has nothing to do with forgiveness. Remembering this is especially important if you’ve been a victim in some way. Radically accepting the future is a little tricky. You only need to radically accept realistic limitations on the future. Every life has limitations, but we often exaggerate those limitations. For example, if you and your partner break up, you need to radically accept the relationship is over. You do not need to radically accept that you will be alone for the rest of your life. When you are radically accepting, check your wise mind to make sure you are only accepting facts. Read our post next week to learn HOW to radically accept and to look at some examples of radical acceptance in action. Need help in radically accepting something in your life?